I haven’t blogged as much as I had hoped to lately. Between processing the closing of Windsor Button – which happened on the 13th – and the deadline for taxes which fell on Marathon Monday (the non-profit I work for had 15 runners in the race), I had little brain space to write. I promised myself I would pick up my cyber pen again afterwards. If you don’t know what I’m talking about, I’ll let your favorite search engine provide you with the details. Boston. Marathon. 2013. That ought to get you plenty. But frankly if you don’t know what I’m talking about count yourself lucky and step away from the computer now. Ignorance can be bliss. But I have two observations to make. The first – because this is a knitting blog – is that there is a level of anxiety, unease and fear that even I am not able to knit my way through successfully. Once news of the Marathon bombing reached me, my hands were only good for channel-surfing, web-browsing and speed-dialing, trying to ascertain whether my friends and associates were unharmed. (They were.) Twice during the ensuing week, once I could apply myself again, I worked most of a cable row with the cables crossing in the wrong direction. The first time it was several inches later before I noticed. The second time was during the lockdown and I noticed fairly soon, corrected it, and continued knitting – only to discover the next morning that I had to take out everything from the previous day because I had neglected to start decreasing when I should have. Still, I suppose there was some value to having my project to clutch in my hands even as it lay limp in my lap, or to have a channel for nervous fidgeting energy even though it did not let me salvage true productivity out of the wasted day. Nor did it do much to distract me from the unfolding news. My other point, though, is that I am so proud of us! I am so proud of how prepared and responsive our public safety and medical personnel were, how effectively communication happened in emergent circumstances. I am proud of the cooperation and coordination of all the different agencies that brought the week to a resolution. I am proud of how our local and state officials conducted themselves throughout the ordeal. As tired as we all must have been of hearing and seeing the same coverage over and over during the intense days, I was even proud of the professionalism and restraint of the media. (I never thought I’d see a press conference that began with the announcement that there would be no questions actually end with …. no questions. But this happened repeatedly this week.) And finally, I was proud of my fellow urban residents – a million strong – who stayed indoors and off the street on a beautiful warm spring day because that was how we were asked to help. It was a privilege being locked down with you. My fingers are currently flying to finish the Cabled Poncho by Norah Gaughan from Vogue Knitting, a project I impulsively but with very good reason chose to make for a coworker and which I foolishly but for very good reasons chose to make in black. For those who aren’t already a step ahead of me on this, both the fact that I am working in a nubbly black yarn and the fact that it is a Norah Gaughan pattern means I need a strategy – a plan – a way of cheating – if I hope to complete this otherwise easy project with my sanity intact. Whew! Doesn’t it make a whole lot more sense when you see how it lines up? I thought I might actually work a project with no changes this time, but I decided to stop increasing several rows sooner than the pattern calls for in order to prevent the poncho from becoming too long for my petite colleague. I will continue to knit as many rows as the pattern calls for before dividing for the neck, but without the increases at the top it will pull in to create a bit of shaping for the shoulder. I hope this will turn out to be a nice feature. I made this decision because otherwise the “sleeve” edges would fall too short and I only wanted to make it shorter at the bottom hem. (If I had planned on making it shorter ahead of time, I would have just cast on fewer stitches to begin with.) I might also make the neck opening ever so slightly smaller and I am considering modifying the collar so that it does not stand up quite so much. But all in all, I am working this beautiful pattern as intended and full steam ahead so that my friend can stop shivering as soon as possible. Since I took the time to figure out a good way to cheat, I can knit away without slowing down to think! Managing a Knitting Project – Cheat! I get the impression from the classes I teach that a lot of knitters think that, with the pattern open in front of them and yarn and needles in hand, a garment should appear stitch-by-stitch aided and abetted only by the steady transfer of information through the eyes. If only it were that simple! But the wailing that eventually sets in proves otherwise. I lost my concentration and can’t remember if I just purled or knitted! I put it down and don’t remember what row I’m on. Is this the side I’m supposed to do an SSK or a K2Tog? What do they mean AT THE SAME TIME?!?! The fact is that for projects more complex than a basic scarf, following a pattern requires a strategy. Working a knitting pattern is not like reading a book, where you proceed word-by-word and line-by-line from beginning to end. The best patterns provide resources beyond the row-by-row stitch directions, including photographs and schematics. There are bold headings for each separate garment section which give you an indication of how the garment will be constructed. Any unique terms or stitch patterns will be defined somewhere. You do not get knitting bonus points for attempting to work a pattern while ignoring these aids. Once you have used all the clues provided to get at least a partial sense of what you will be trying to accomplish, it can often be useful for you to come up with some aids of your own. If it seems like cheating, then fine! Cheat without shame! Anything you can do to reduce frustration and wasted energy and the likelihood of mistakes so you can focus on the joy of creating something beautiful has my blessing. Cheating aids can be plain or fancy! Some of my favorite knitting aids don’t come from my local yarn store, but from the office supply store. Sticky notes are great to use to keep your place in a written pattern or chart, not only to keep track of where you are but to help guide your eye in reading for less stress and greater efficiency. If a particular set of directions isn’t clear to you, you can write them in your own words on a sticky note and stick it onto the pattern. 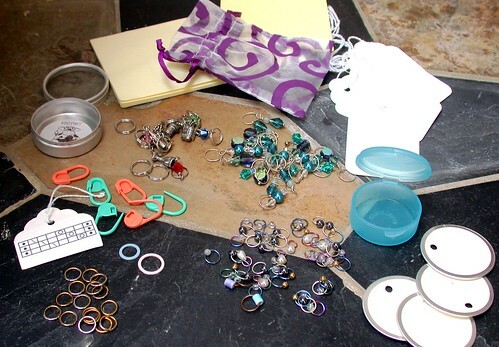 But my very favorite trick is to use price tags, key tags or cut-up hole-punched bits of index cards to tag my project with reminders at crucial places. Let’s say you are working a pattern where you are decreasing every so-many rows on the armhole edge while decreasing at a different rate at the neckline….while working in a pattern that has cable crosses every x-number of rows. Write each different shaping instruction on a little tag and pin it with a removable marker to the appropriate section of the project. That way, when you get to the neck edge, your little reminder will tell you exactly what you are supposed to do there. 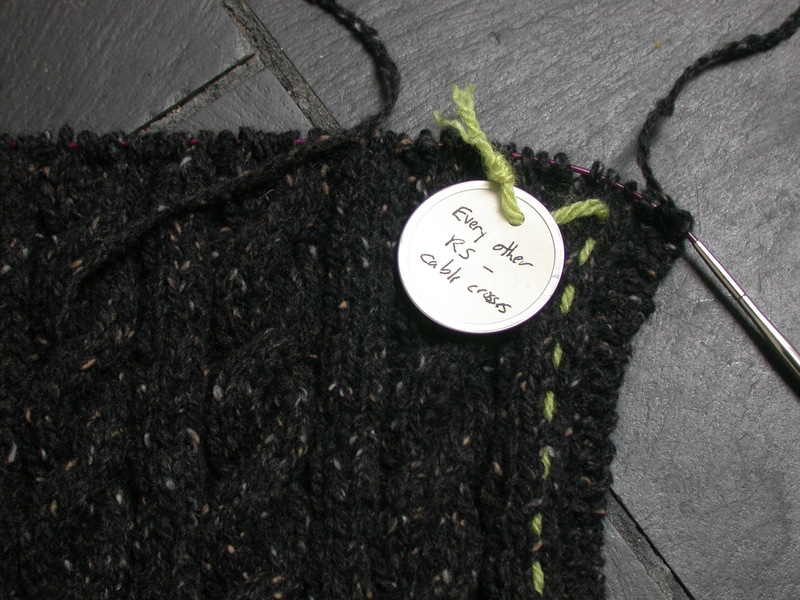 Your tag on the armhole edge will tell you what to do at that side. And in between, your tag telling you to cable every 8 rows (or whatever) will keep your stitch pattern on track, especially if you think to move the marker each time you cable to keep track of where your last cross was. 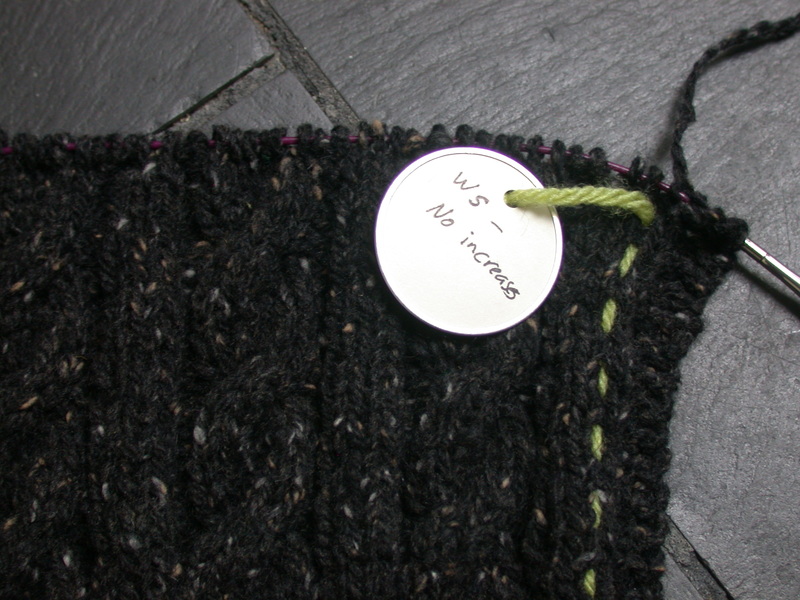 Another example I have used tags for was in making socks when I was first getting the hang of heel shaping. I put “k2 ssk” on one tag and “k2tog k2” on another and hung these on the appropriate sides of the gusset area. Each time I came to these markers I knew just what to do, without having to think about it (until eventually I could do it without having to think about it). Sometimes I photocopy smaller stitch charts and “laminate” them with clear packing tape. By pinning them as tags to my project, I don’t have to keep looking away from my work to see what I need to do next. This was especially useful when I worked on Oblique from Knitty, where each row is broken up into several sections each with different lace stitch designs. I pinned the appropriate stitch chart to each section so I could work without distraction. I don’t know about you but I want to enjoy the process of knitting. I want it to be challenging, yes, but also relaxing. And productive! Ripping out (while sometimes unavoidable) is not an efficient or pleasant use of my time. Anything I can do with materials at hand to help keep myself on track with less effort, I will do. And you should, too! I CHEAT AT KNITTING! WILL YOU JOIN ME? It turns out that there will be one more week of classes than I previously expected. I will be teaching through the final store closing date of Saturday, April 13. I hope to see you there on Thursday or Saturday! The store is now in their final phase of markdown and clearance. While they have run out of some highly coveted items, they still have more yarn in stock than most other yarn stores I know of. (I am told the back stock in the basement is still about equal to the stock they have out on the floor!) So please come, allow lots of time for shopping, and help Susan and Stan during this difficult time by giving a home to as many of their beautiful products as you can – at an excellent price! I will not be teaching this week on Holy Thursday or Holy Saturday, but will return the following week for what may turn out to be our last week. Hope to see you there! Taking whatever Life throws at me one stitch at a time.